An expecting couple have the world’s most adorable baby photo framed in their home — and their kid isn’t even born yet. The cheerful image was taken during pregnant mom Nicole Kim’s 20-week routine ultrasound appointment late last month. Kim and her husband, Tony, who are already parents to two boys, ages 5 and 3, were expecting to discover the gender of their third child. Before the technician could get around to telling the couple from Calgary, Alberta, that they were having another boy, she noticed something unusual in the grainy black-and-white image: their in utero bundle of joy appeared to be giving them the thumbs-up sign. “I thought it was the neatest thing. We just couldn’t stop smiling,” Kim told the Calgary Herald on February 2. Charmed by the good vibes the baby was sending, the technician zoomed in to get a close-up of the thumbs-up gesture. She printed it out for the couple, who shared it with Nicole’s mom group on Facebook. The now 22-week-old baby, due in June, seems to be sending his parents the message that everything will work out. It’s a fitting gesture, as Tony has been going through some hard times. “My hubby was laid off four months ago, and we found out we were pregnant with our third baby right after. This photo tells me that, yes, everything is going to be all right,” Kim told Global News. 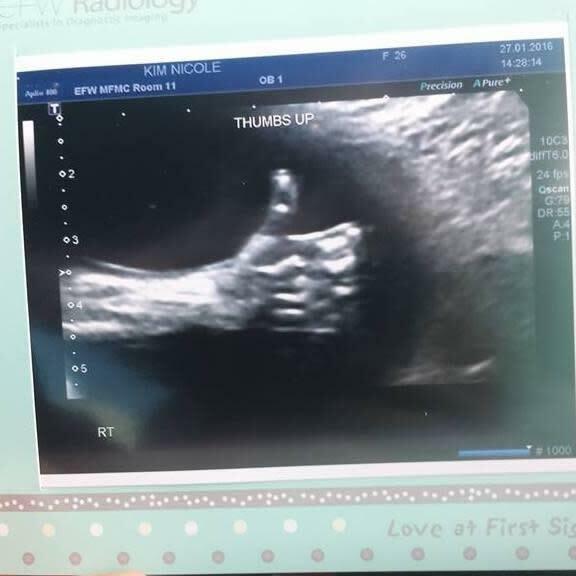 It’s not the first time an ultrasound image has shown an unborn baby flashing the thumbs-up sign. In 2014, an image surfaced on Reddit of a baby dubbed the “Fonzie Fetus” for his cool everything’s A-OK gesture.